Indicates a 5/8 diameter shaft two axis slide body. standard style with 5/16-18 UNC tapped mounting holes. 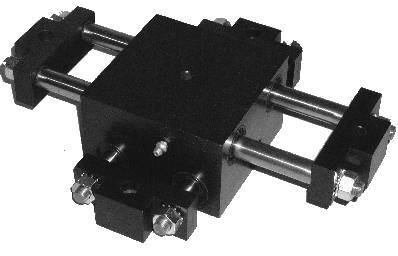 Indicates a 1/2 diameter shaft two axis slide body. style with 1/4-28 UNF tapped mounting holes. Please see chart above for maximum values. Order in .25 inch increments. BST or BWT per chart below. 4. Tie Bar "A" Hole Detail "UA" or "WA"
See appropriate ordering code charts. 7. Tie Bar "B" Hole Detail "UB" or "WB"
Please note that all threads in Aluminum in this data sheet have been changed from UNF to UNC. However, existing stock with prior hole type will be depleted before change is implemented. Please note that the custom "Z" height for the alternate keyed tie bar style has been discontinued.